Live Below The Line Challenge- T-1 day, shopping complete! So…yesterday afternoon was exciting. After an “all-you-can-eat” lunch, I trekked down to Bedminster to stock up on food for next Monday to Friday, armed with just a fiver. It was a bit of a mission. 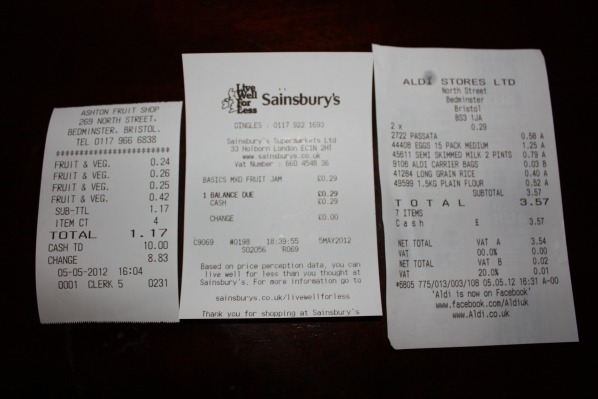 I’d chosen Aldi as the source of most of my food…and spent a LONG time in there noting down prices of various things, before heading to the Ashton Fruit Shop over the road to buy meagre quantities of vegetables. I think I probably annoyed the girl behind the counter a little. I explained the challenge to her and told her I had very little to spend, then promptly spent the next ten minutes going backwards and forwards between the produce and the counter, saying “how much does this cost?”…running back to add/remove the odd mushroom here and there…and again, “how much does this cost?” I think she was glad to see the back of me – I put her to a LOT of effort for under a £2 spend. Armed with my change, I headed BACK to Aldi and bought the rest of the items I needed. And then called a taxi to take me home – lazy, I know, but I didn’t want to risk breaking any of the massive box of eggs that have to see me through five days! Taking the 3p cost of the Aldi carrier bag off my bill, it appeared that I had a massive 29p left to spend. You can’t get much for 29p, as I soon found out in the Sainsbury’s on the Triangle. Realising that I had nothing sweet amongst my previous purchases, the whole of the remaining amount went on a (conveniently) 29p jar of Sainsbury’s Basics Mixed Fruit Jam. It’s a bit of a sorry sight, to be honest! 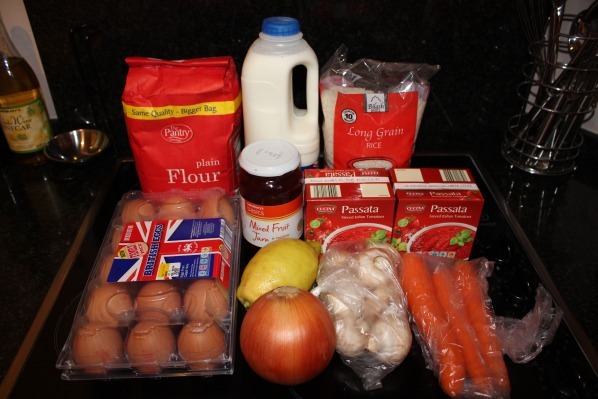 The flour will be used for the flatbreads, the passata and veg (and some of the eggs) will accompany the vast quantities of rice that I’ll be eating, and the plan for the milk is to make paneer – a suggestion that was given on the Bristol Bites Facebook page. I had a trial run of the paneer last night and it seemed to work – I’ll put the recipe up tomorrow. This evening will be spend doing some real planning in terms of the quantity of food available for each meal on each of the five days: no one day can exceed £1 in terms of the cost of ingredients. Time for some careful weighing and measuring, I think! There’s still time to sponsor me! If you’d like to contribute to the cause – no matter how much or how little you can give – your support would be massively appreciated! Simply click on this link to visit my page on the Live Below The Line website and donate…thank you! 6 Responses to Live Below The Line Challenge- T-1 day, shopping complete! 2 pints of milk isn't going to make much paneer – and you'll be wasting the whey unless you add it to soup or something. Also, 15 eggs in 5 days is not going to do you much good healthwise – that with the absence of green veg and overdose of refined carbs (or are the flour and rice brown?) and your body will be screaming for mercy in less than 5 days! Have made paneer with 1 pint of the milk, and it's not a bad amount – saved the other pint. Re: eggs – I know, figured I needed the protein though! It's definitely going to be a tough challenge…but I've managed to shop more healthily than others who are doing the challenge…I've seen some blogs from people who are planning on living on 11p instant noodles for the week! I think would have bought brown rice or couscous, some kind of dried pulse – red lentils are cheapest, a big bag of frozen spinach and cheap full fat plain yoghurt. Any left over money to go on spices – maybe just cheap curry powder at a push, but preferably fresh chillies. I'd make a big pan of spinach dhal and divided it into 10 portions – 2 per day – to be eaten with grain and yoghurt. But I couldn't survive without my freshly ground coffee – so no way I could live on £1 a day. £1 a day is surprisingly difficult – especially in terms of fresh fruit and veg. For me, the priority was making sure that I bought food that would make me feel full – and including something sweet as my blood sugar levels are a little haywire! Two meals down and I'm feeling full, just not satisfied!